You are looking for a perfect matching logistic partner for your business? We at Interfracht are providing tailor-made ocean freight concepts for more than four decades. Interfracht helps you to organize all kinds of container shipments (FCL + LCL). By having the flexibility of all container types and sizes, we make sure your goods arrive at the right place and the right time and as cost effective as possible. Strategically chosen partners and networks enable us to offer you the perfect logistic-package. By using selected first class carriers, professional customs clearance, and warehousing or personalized packaging solutions, we offer an uncomplicated door to door transport. Today’s modern sea transports are not just a port to port movement anymore. For pre- and post carriage, we organize a seamless transport solution by using railway networks, trucking and inland waterway transportation. We are able to arrange a seamless chain of transport from collection point to the final destination. According to your needs, we offer a door to door service by FCL (standard or special equipment). Our expertise in choosing the right type of equipment, together with customs documentation plus a global network of reliable carrier allow you to rest assured. Use the advantage of Interfracht LCL and Fast Ocean LCL Service. For less than container loads (LCL) we arrange weekly consolidated services to and from various points in The USA, Canada and several Asian countries. Some of these services even offer the FAST OCEAN CONSOL CONCEPT – an expedited transit time solution. Of course we offer you consolidation services (LCL) to other destinations (import / export) in cooperation with our long-standing partners. Please get in touch with us for more information. 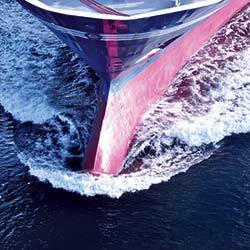 Want to know more about our Fast Ocean Services?